Spring-Green Lawn Care now serves Columbus, Ohio and the surrounding area. Spring-Green Lawn Care – provider of residential and commercial lawn fertilization and weed control - is proud to announce its newest franchise owner, Aaron Knepp of AK Irrigation in Columbus, OH. 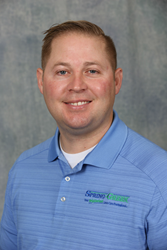 Aaron Knepp, a seasoned Green Industry expert who sought to expand services to meet both his current customers’ needs and the growing market needs of Columbus and the surrounding areas. He will be offering customers a seven-application fertilization and weed control program. In addition, Knepp is excited to expand his mosquito services, aeration and seeding, as well as tree care programs. “The timing is right to expand my business, and the market needs a local professional to provide lawn care services,” said Knepp. Knepp started AK Irrigation in 2006, which has grown from its humble beginnings to a 15 truck, 17 employee company. Knepp cares for over 4,000 lawns while performing irrigation and sprinkler system maintenance, new system installation and other related services. In the past, customers had to use a different provider for their lawn care services. Now, the Knepp’s will provide those services through his Spring-Green franchise. “I wasn’t looking to build another company from scratch, I wanted a system to follow and something more turnkey” said Knepp. Knepp and his wife, had a plan to begin offering weed control and fertilization services, but were hesitant to get started knowing the work involved in a new business. Franchising wasn’t even a consideration until learning about Spring-Green and understanding how the businesses could work in conjunction with each other. The Knepps along with their five children are excited about the potential growth that the Spring-Green opportunity will deliver to their family. “It’s always rewarding when a successful Green Industry business owner recognizes the value in our franchise and sees the opportunity to build a recurring customer base that works in conjunction with their existing business. Expanding to Columbus, OH with Knepp is a perfect example of an owner understanding the power of combining resources to propel them further and faster than they could do independently. Together we can do great things!” - James Young, President of Spring-Green Lawn Care. Founded in 1977, Plainfield, Illinois-based Spring-Green Lawn Care has been delivering lawn and tree care services nationwide for over 40 years. Its service is centered on the beautification of residential and commercial customers in middle-class and affluent neighborhoods and communities. Spring-Green is an attractive opportunity for entrepreneurs and existing green industry business owners who want to align themselves with a business model that has proven economic resilience, healthy profit margins, industry leading business and marketing intelligence, recurring revenue, and retirement and succession planning. For more information, visit http://www.springgreenfranchise.com.